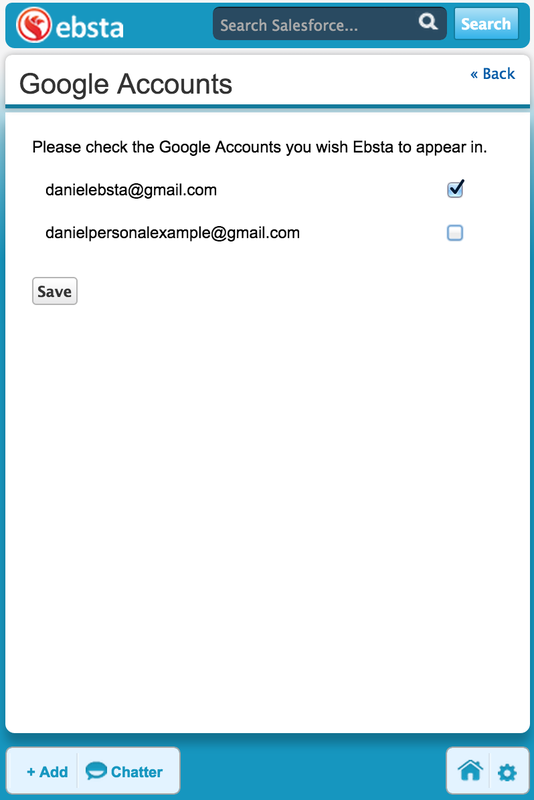 Once you have installed Ebsta and connected to your Salesforce account, Gmail users can connect Ebsta to their email account to gain access to all of Ebsta's Gmail integration features including Email Sync, Calendar Sync, Email Tracking, Meeting Scheduler, Email Campaigns and Send Later. 1. Click the Ebsta button in the top-right of Gmail. 2. Ebsta's set-up wizard will open. Click Connect your Google Account to Ebsta. 3. Confirm which account you wish to connect to Ebsta. 5. Your Gmail account* will now be connected to Ebsta. You will notice the Ebsta notification bar drop as you read through your emails and Ebsta's icons will be visible in the compose window and when you open an email giving you access to all Ebsta's Gmail integration features. * You can repeat this process for other Gmail accounts that you may have. If you wish to stop Ebsta's notification bar appearing in Gmail and you can chose to disable it by following the instructions below. All the Ebsta icons will still be visible when you are reading emails and composing messages so you will still have full use of all of Ebsta's features and you will still be able to determine if records exist in Salesforce or not as Ebsta will display the relevant Lead and Contact icons next to the Senders name in your inbox. 1. Right-click the Ebsta icon in the top right-hand corner in Chrome and select Options. 2. Check the Switch the Bar off in Gmail box and click Save Options. 3. You will need to reload Gmail so that your new settings take effect. You can chose to disable Ebsta from a particular Gmail account so Ebsta's blue notification bar and icons are no longer visible. 1. Click the Ebsta icon in the top right-hand corner to open Ebsta. 2. Click the Settings icon in the bottom right-hand corner. 4. Uncheck the boxes next to the Gmail accounts you do not wish Ebsta to be visible in. For example, Ebsta will appear in danielebsta@gmail.com but not in danielpersonalexample@gmail.com. 5. Click Save and then reload Gmail for your new settings to take effect.